TableauWriter writes data in Tableau (.tde) files. The component depends on native libraries. Input metadata of TableauWriter cannot contain data types decimal, long, byte and cbyte. Tableau types do not have sufficient precision for CloverDX types decimal and long and the conversion would be lossy. A recommended alternative to decimal data type in TableauWriter is number (double), an alternative to long is integer. CloverDX data types byte and cbyte do not have a corresponding Tableau data type. Metadata containers (list, map) are not supported. To set up mapping of particular metadata fields on Tableau metadata, use the attribute Tableau Table Structure. An attribute specifying where received data will be written. The file name must have the .tde suffix. The prefilled value Extract required by Tableau. The value cannot be changed. Value of the default collation used in the Tableau Table Structure dialog. Tableau table structure See Tableau Table Structure. 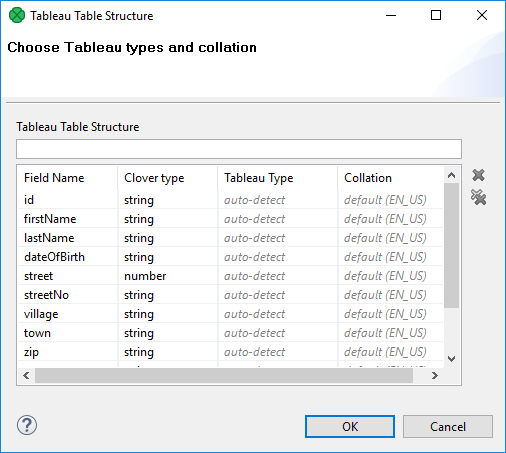 The Tableau Table Structure dialog serves to assign Tableau data types and collation to particular metadata fields. The input field above the list of fields works as a filter to the displayed fields. TableauWriter depends on native libraries. You need to download the libraries and set up your operating system to use it. OS X is not currently supported as there are currently no native Tableau libraries for OS X. The libraries can be downloaded from Tableau - Data Extract API. To use TableauWriter on Linux, add Tableau's bin directory to system PATH. The Tableau's lib[32|64]/dataextract directory must be on LD_LIBRARY_PATH. For more information, see the Linux documentation: Shared Libraries. To be able to use TableauWriter on Windows, you should add the bin directory of Tableau to system PATH. More TableauWriters cannot write in the same phase as Tableau API is not threadsafe. When a .tde file is open in Tableau application, CloverDX cannot write into it. TableauWriter cannot write data directly to .zip files via URL (e.g. zip:(/path/file.zip)#file.tde) as the URL from the component is passed down to the Tableau library and the library cannot write zip files in this way. allow memory overcommit (see overcommit accounting). In the latter case, make sure you understand the implications. More TableauWriter components cannot run at the same time. If there is TableauWriter component already running, and the second TableauWriter component needs to run, the graph with the second component fails. 4.0 TableauWriter component is available since 4.0.0.